10012017_The_Rise_Of_Germanys_New_Right_0033: The Rise Of Germanys New Right: Made in Germany: Hermann Bredehorst - editorial and portrait photographer Berlin, Germany. January 10, 2017 - Berlin, : Italian visitor Francesco Leonelli from Rome reads a news paper inside the reading room of the library of conservatism. He made friends with the library's employee Jonathan Danubio via facebook. He says he finds here everything about German author Ernst Jünger who's work he likes reading. Visitors study inside the Bibliothek des Konservatismus (library of conservatism). 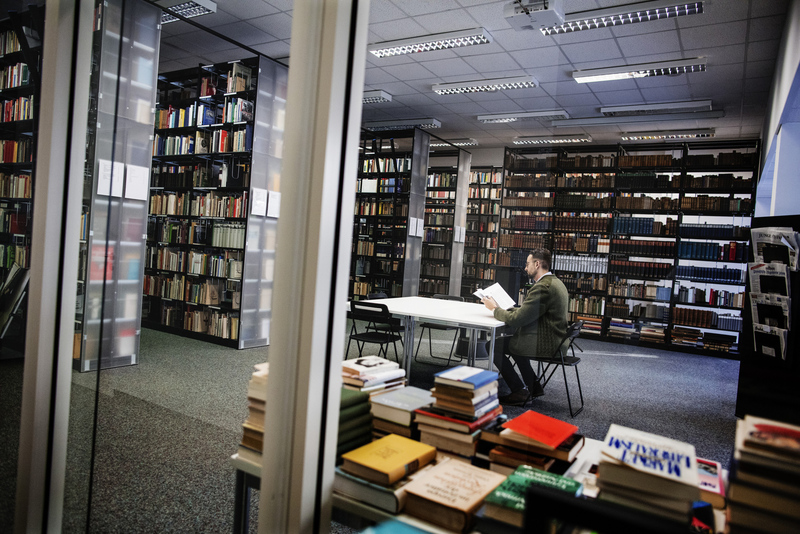 The Bibliothek des Konservatismus is part of the new right movement in Germany and a place where Nationalists, Anti-Abortion activists and right wing authors find an intellectual space to meet and discuss with each other. The library regularly hosts right wing lectures and has all kind of micro published right wing and identitarian movement literature on display.